Beaudesert Shire, an area of 2858 sq km, extended from Browns Plains (Logan City) on the Mount Lindesay Highway to the New South Wales border. Its eastern and western boundaries were the Gold Coast municipality and the Ipswich and Boonah municipalities respectively. The southern ranges and Lamington Plateau have the headwaters of the Logan, Albert and Coomera Rivers, which all flow north-easterly through the former shire. Local government began with the Tabragalba division (1880) named after a locality 6 km east of Beaudesert. By then there was considerable agricultural settlement in the Logan Valley, and the main village was Veresdale, north of Beaudesert, which had been surveyed as a township but consisted mainly of unsold allotments. The extension of the railway from Bethania to Beaudesert in 1888 stimulated rapid growth in the new railhead, which became a freight centre for several communities extending as far as the McPherson Ranges. The township, and the shire (1903), were named after the Beau Desert depasturing licence settlement (1842). Between 1912 and 1929 there were separate Beaudesert town and shire councils. The shire had numerous timber settlements – Tamborine, Canungra and Rathdowney among others – and a shire tramway (1903) ran southwards, divided into two lines. The tramway carried livestock to the Beaudesert saleyards and dairy produce to the Logan and Albert Co-operative butter factory (1904). Beyond the reach of the tramway lay the Lamington Plateau. The plateau was proclaimed as a National Park in 1915 after agitation by several prominent residents of the shire. Robert Collins, the son of John Collins who settled at Mundoolun (north-east of Beaudesert) in 1847, was inspired by the American Yellowstone National Park. R.M. Lahey, with timber interests at Canungra, took up Collins' enthusiasm and achieved the proclamation of the National Park which entirely surrounded the O'Reilly family's dairy selection. As visitors came to the National Park, the O'Reillys diversified, opening a guest house in 1926. Bernard O'Reilly's successful 1937 search for a crashed Stinson airliner caught public attention, and his subsequent books published in their thousands, made O'Reilly's a national tourist destination. The Groom family's Binna-Burra Lodge (1933) achieved similar fame. Lahey and Groom were founder members of the Queensland National Parks Association. 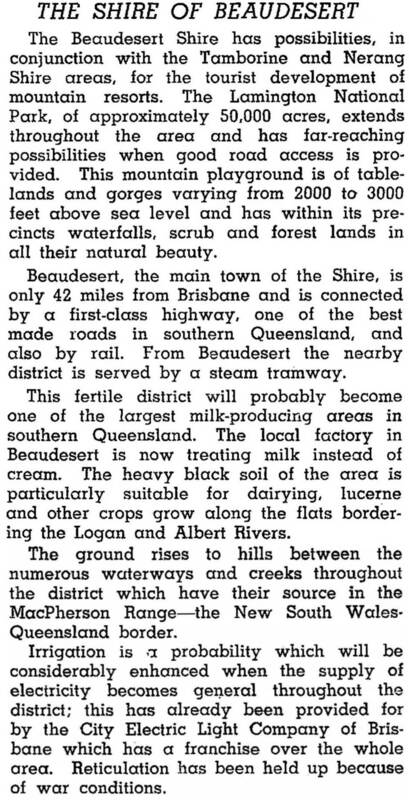 In 1949 Beaudesert Shire was enlarged by absorbing Tamborine and Waterford Shires. Beaudesert Shire became an important dairying district, although meat cattle grazing overtook dairying: in 1993 there were nearly 80,000 beef cattle and 22,000 dairy cattle in the shire. Dairy herds decreased by two-thirds in the period 1967-93. Former grazing properties were subdivided and sold off for acreage rural/residential development. Statistically, Beaudesert Shire was in two parts: the northern, extending north from Jimboomba and treated as part of metropolitan Brisbane, and the southern, extending to the Lamington Plateau. Agriculture in 2001 accounted for 5.4% of the shire's labour force, three-quarters of which occurred in the southern part. Accommodation and hospitality accounted for 4.1%, two-thirds in the southern part. The reverse was the case with manufacturing (14.5% of the shire's labour force). Employment in construction (15.6%), community services (8%) and education (6.4%) were divided between the northern and southern parts roughly in proportion to their respective populations. In 2008 the northern part of the shire (Veresdale, Jimboomba, Logan Village etc) was united with Logan City. The southern part (2219 sq km) from Tamborine to the New South Wales border was amalgamated with Boonah Shire and a small part of Ipswich City to form Scenic Rim Regional Council. Three-quarters of government and defence employment (5%) was located in the southern part of the former shire, resulting mainly from the location of the shire headquarters in Beaudesert and the Army's Land Warfare centre at Canungra. Median ages were 32 in the northern part and 36 in the southern part in 2001.